One of my great joys in life is being a mom. I especially like these days of being a mom...long hours talking with my teenage/adult children, good times in the car on the way to and from school every day, being together in the kitchen while making food, sitting in front of the fireplace watching a movie together, sitting by their beds praying with them. Oh...I haven't forgotten about the 2 AM feedings of long ago...or the fevers all through the nights...or the tears over painful things that I couldn't take away. I loved being a mom then too. Holding, hugging, praying, loving, nurturing, disciplining...all part of the job that I loved. Every now and then you get a sweet glimpse of what it means to your kids that you've been their mom, through thick and thin, in the good times and the hard ones. At Christmas, Tyler gave me a gift...it was an actual "thing", but was accompanied by words that made the gift all the more special. 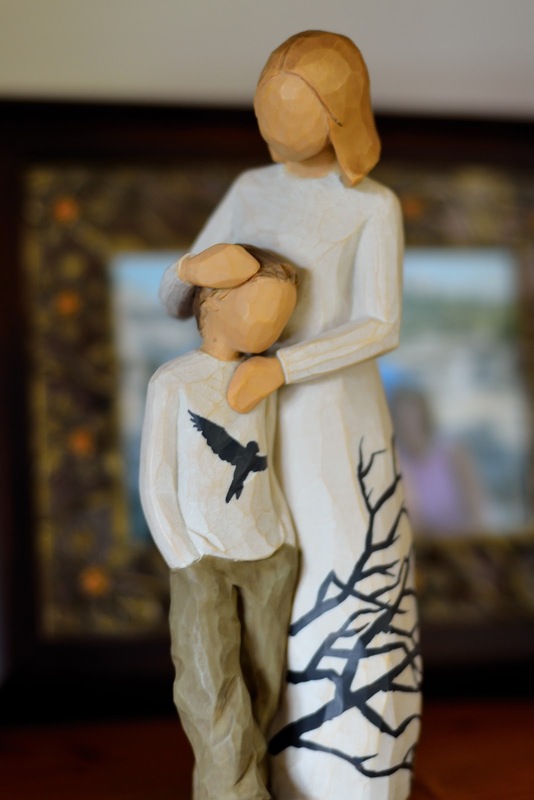 He'd bought me a Willow Tree angel...a mom and her son. When he showed it to Claire before Christmas, she told him that I have one just like it from Caleb (given to me one Mother's Day when he and I were in the States while he was sick). Not to be discouraged, he decided to personalize the angel. With his artistic eye, he took some simple black paint and a brush and gave it some new life. When I opened his gift on Christmas Day he gave these words with it: "You've always been a safe place for me...a place to "land" when I needed to. But you also gave me wings to fly and let me go without trying to hold me back. I know I can always return to that safe place...but I'm flying now and you are doing a good job of letting me do that." I have SO wanted to be that kind of mom...one who loves and nurtures well, but one who also knows when to let go. I've tried to do that, even though it was hard. And I didn't know if I was doing it very successfully. Tyler's words were such cool water to this mom's soul. I'm glad in his eyes, that I am that kind of a mom. YOU ARE!!! To all of us! :) Love you Mom!